B. FIGHTERS MUST STAY JOINED UP. E. BACKSTOP THOSE THAT BREAK THROUGH. F. IMPORTANCE OF ACCURATE INFORMATION ON STARTING POINT OF FIGHTERS. G. FIGHTERS MUST BE KEPT BETWEEN RAID AND BASE. J. 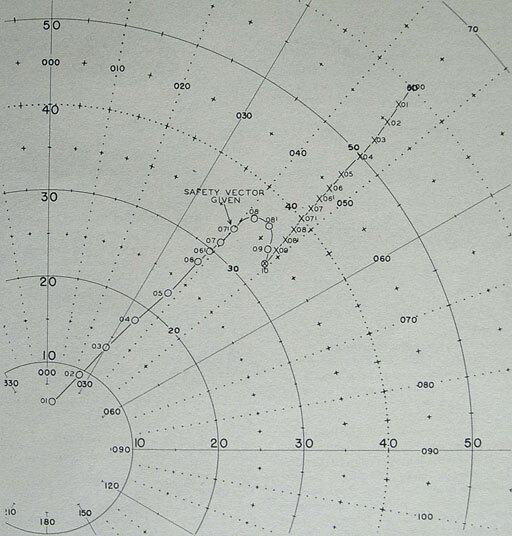 RANGE AT WHICH TO INTERCEPT. L. FLIGHT LEADER MUST BE KEPT FULLY INFORMED. M. ADVANTAGES OF SUN AND CLOUDS TO FIGHTERS. O. ABBREVIATION OF R/T PROCEDURE. Note: The methods, procedures, and techniques, described in this chapter, for effecting Day Interception with conventional type aircraft, were evolved and proven during World War II. These methods, procedures, and techniques are still effective and will continue to be effective for some time to come. New methods to meet the future requirements for high speed, high altitude type interceptions using jet aircraft are presently being developed. As changes to the existing procedures are adopted they will be promulgated. When a bogey is detected by radar, it is important that defending fighters be vectored out to intercept at the earliest possible moment. The speeds of present-day combat aircraft are such that the elapsed time between initial pickup and arrival of the attack over the force does not permit waiting until all desirable information has been obtained before starting fighters out. It should be remembered that the sooner fighters start out to intercept a raid, the greater will be the distance of the interception from the force. This means that the fighters will be able to make more runs on the enemy group, and the chances of the attack being broken up before it reaches the force will be greater. The controller should not unduly delay while a check is being made with other sources for confirmation of the bogey as such. Fighters can always be brought back if the bogey later turns out to be friendly. Nor should he wait until the track of the bogey has been determined. Corrections by change of vector or speed can be made while the interception is in progress. A raid can be broken up much more effectively if the fighters attack in one large group rather than several small groups. For example, if the controller can commit 20 fighters to an attack, it is much better to hit it simultaneously with all 20 rather than hit it first with 12 and several minutes later with 8.Furthermore, the use of larger groups joined up reduces confusion of the radar picture. When fighters are vectored out to intercept a raid, the bulk of them must be placed higher than the probable altitude of the bogey. Altitude advantage is a cardinal rule of lighter tactics. The controller must see that this is always the case when vertical visibility permits. An actual altitude advantage of at least 2,000 feet is necessary, of 3,000 to 4,000 feet usually desirable. The altitude to which the controller actually orders the fighters will depend on the reliability of the CIC's altitude estimate on the bogey. The less reliable the estimate, the greater should be the difference in altitude between fighters and bogey. 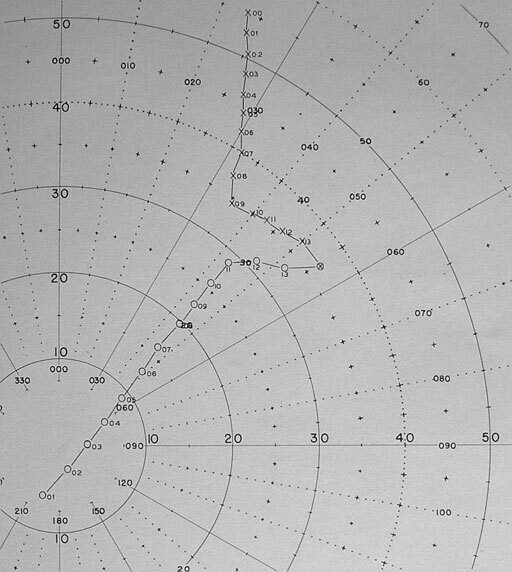 When fade charts are being used to determine altitude, there will often be two or more altitude possibilities. In such a case, take no chances. Altitude advantage should be given with respect to the highest altitude possibility. If the controller is unable to make any estimate of altitude, fighters should be sent as high as they can go in the time it takes them to reach the bogey. During the periods of low visibility, or when a raid is coming in low on the water, it is often necessary to reduce the altitude advantage of the intercepting fighters in order to improve chances for visual contact with the enemy. HIT THE ENEMY BEFORE THEY CAN BREAK UP. Figure 89.--Intercepting before enemy sights formation. The practice of keeping fighters higher than the highest altitude estimate of the bogey can result in having the fighters at 25,000 feet when the bogey is at 5,000 feet. This situation is bad, because a plane that is low on the water is hard to see from a high altitude. The solution lies in stacking the fighters in altitude. Normally, it is the duty of the controller to indicate the necessity of stacking to the flight leader, adding any information such as the fact that the bogey is strung out in range or the possibility of enemy fighters flying as high cover for the attack. what type of stacked formation he will use and how many fighters he will send down to a lower altitude. Flight leaders must advise the controller of decisions and actions taken. 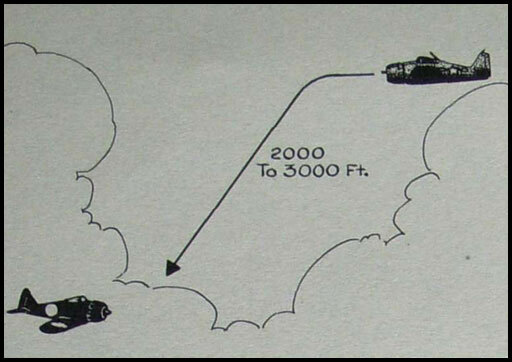 Stacking will also be necessary if there is an appreciable amount of cloud cover between any two altitude possibilities of the bogey, or if bogey altitude indicates he is flying just below or in the clouds. It should be remembered that stacking of fighters complicates identification and control as well as dispersing the strength of fighters sent out to intercept. Therefore, such tactics should be employed with discretion and only when necessary. When large groups of enemy aircraft are being intercepted and sufficient fighters are available, it may be advisable to send out a second group of fighters about 10 miles behind and below the main intercepting group to be used as "backstop" against enemy aircraft which may escape the main intercepting force. The "backstop" fighters should be orbited about 10 to 20 miles inside the point of interception to engage any enemy planes which evade the intercepting fighters. Distance of the "backstop" from intercepting aircraft will vary with range of interception from base. If too close, "backstops" may complicate the intercept picture. In order to facilitate identifying fighters among other friendly aircraft in their vicinity, and in order to make dead reckoning more accurate, it is highly desirable to have the approximate position of the fighters when they start out on vector. 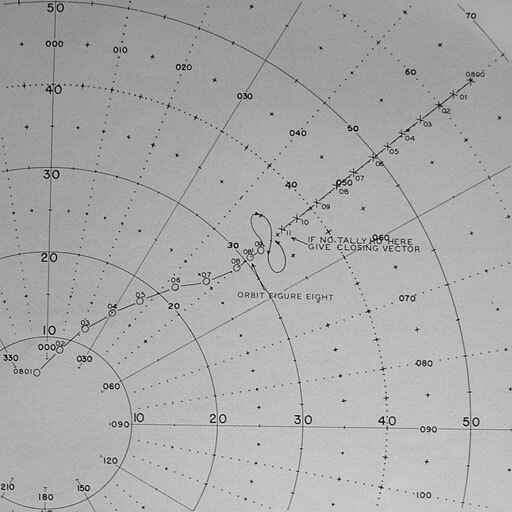 A common method is to have the flight leader report his position with respect to the controlling station or to some known geographic point when he reports steady on vector. Advantage of this method is that it allows pilots to get on vector and commence closing the bogey in a minimum of time. One disadvantage of this method is that pilots' position reports tend to be inaccurate. However, it is usually accurate enough for the purpose it serves. GIVE YOUR FIGHTERS ALTITUDE ADVANTAGE! NO MATTER HOW FAST A FIGHTER CAN CLIMB, HE CAN DIVE 2 OR 3 TIMES FASTER. have the fighter slightly ahead of the bogey bearing, to prevent the development of a tail chase. Only when fighters are in such a position can the controller correct for any course changes or evasive tactics on the part of the bogey. The case of enemy aircraft approaching the task group head-on is comparatively simple to handle. So long as the fighters are sent out on the bearing of the bogey and the bogey's bearing does not change appreciably, one vector should be sufficient. 0800 -- "Mohawk Two-one, this is Mohawk. Vector zero-five-zero. Gate. Angels three. Over." "This is Mohawk Two-one. Wilco. Vector zero-five-zero. Gate. Angels three. Out." 0801 -- "Mohawk, this is Mohawk Two-one. Steady. South two. Over." "This is Mohawk, Roger. Out." 0801 -- "Two-one, this is Mohawk. Eight Bogies, one thousand, 12 o'clock ten. Over." "This is Mohawk Two-one, Roger. Out." 0802 -- "Tallyho. This is Mohawk Two-one, Eleven o'clock--three--six hawks-one thousand. Over." "This is Mohawk. That is your bogey, out." The crossing type raid presents a more difficult intercept problem since the bearing of the bogey is constantly chunginfe To aim fora point at which the bogey migl % be expected to be at the time the fighters reach it would necessitate "leading" the bogey considerably, so much so that the fighters might be too far off the bearing of the bogey to catch it if it turned away, reversed course or turned over the base. The better method is to give vectors which lead the bogey sufficiently to keep the fighters slightly ahead of the bearing of the bogey. In so doing, the controller always keeps his fighters in position to correct for any radical changes in the bogey's course. Avoid getting behind the bearing of a crossing target. Always try to intercept at a maximum range consistent with plane performance, reliable communications, and radar information. Interceptions made beyond visual range are normally preferable since the enemy planes cannot sight and report the friendly forces. Once enemy planes have sighted our forces, the difficulty involved in repelling their attack is greatly increased. The enemy can break up his formation and lei? * each plane make its own separate approach. When this happens, a few of the enemy planes may be able to sneak through and press home their attack. If the enemy initiates these tactics outside of visual range and he is not sure of the exact position of his objective he has the further problem of navigation. In addition, planes that have not sighted our force are less likely to anticipate interception. There are several factors that may alter this rule. In the event of meager fighter cover for our force, it may be wise to sacrifice some distance so as not to allow fighter cover to be drawn "off base" to intercept something which turns out to be of no menace to the force. KEEP YOUR FIGHTERS BETWEEN THE BOGEY AND BASE! Figure 92.--Fighter kept between bogey and base. may dictate a minimum range at which to intercept in case of snoopers. Weather can be a factor in deciding at what range the interception will be made. The controller may choose to intercept at a shorter range in order to have the interception made in an area of good visibility in the event that there are clouds, rain squalls, or the like; conversely, interceptions at maximum range may be desirable in order to get the fighters into a clear area. force, and particularly if there is some doubt as to the intentions of the bogey, most economical cruising speed, or "Liner" is indicated. If the bogey is not detected until it is dangerously close, maximum possible speed, or "Gate" is mandatory. However, maintenance of this speed for more than a few minutes may result in aircraft engine failures; it is certain to cause excessive fuel consumption. Owing to the excessive number of variable factors involved (type of plane, altitude, loading, etc. ), it is not possible to compute indicated air speeds for speed terms under all conditions. Such can be worked out with individual squadrons but for practical purposes the terms better represent urgency of the mission. The amount of information given to the flight leader about the bogey will be governed by the amount of traffic on the Fighter Air Defense Net. If there is a load on the circuit, information must be limited to the barest essentials in order not to "hog the circuit" and keep someone else from getting essential transmissions through to his fighters. Information that must get through to the flight leader includes whereabouts of the raid immediately after flight leader has reported steady on initial vector; estimated altitude; estimated numbers and type; heading; and as frequent reports on position of bogies as possible once intercepting fighters are within possible visibility range. If the Fighter Air Defense Net is not overloaded, it is desirable to give the fighters as much information as is obtainable about the raid including very frequent position reports. 1. It assures the flight leader that communications are still functioning and he is not missing any vital transmissions. Long periods of silence during an interception tend to make the pilots uneasy. 2. Frequent information tends to give assurance to the flight leader that everything is under control and he is not being led away on a wild goose chase. 3. Frequent information gives the pilot a good idea of the amount of time he has to prepare for combat before sighting the bogey. When possible, fighter pilots will make their runs on a target from up-sun. This means that the controller should vector them to a position which makes this possible on tallyho, for the bogey is much easier to spot from such a position. However, the controller should not sacrifice any of the foregoing priciples in order to achieve this situation. It is desirable, but its importance does not justify getting the fighters too far off bearing of the bogey or running the risk of a tail chase in order to achieve it. The same rule applies to clouds. 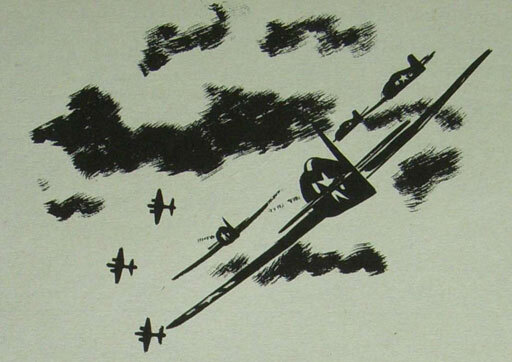 If the fighters can be placed in a position so that the bogey is silhouetted against a bank of clouds, it aids in spotting the bogey; but do not take any chances of missing the tallyho to achieve this. It is the responsibility of the controller to see that radio discipline is maintained, keeping the Fighter Air Defense Net clear of all but essential transmissions at all times. This is especially necessary when an interception is in progress or fighters are in combat. Good radio discipline is 90 percent good judgment. Be clear, be concise, be quick. Say what you have to say, then get off the air. Normally in day interceptions a full voice call is used for each transmission. This is done even though the transmissions are consecutive between the same two stations and only two stations are on the circuit. When the action is fast, however, and it becomes desirable to abbreviate the voice radio transmissions and no possibility of confusion can exist, it is permissible to reduce the length of the transmission by eliminating part, or even all, of the voice call. enemy in sight give approximate number of attacking planes, type or types and altitude. Clock code is used by either controller or pilot in reporting the position and range of other aircraft relative to the fighter plane with twelve o'clock being dead ahead, six o'clock dead astern, etc. In the majority of cases, the pilot will be concerned with clock code primarily in making a tallyho report. 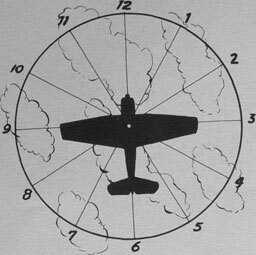 Clock code is usually used when fighters are within 20 miles of target or at range where the size of the bogey and visibility indicates that it is about time for the fighters to sight the bogey. Ahead followed by range is used at all other times. keeping fighter between the bandit and the base, apply in all cases. This type of interception may be employed against closing bogies. Ideally, the interception is not exactly head-on but the fighters are offset sufficiently in bearing so that visual contact of the bogey is made in the 1 o'clock or 11 o'clock position. If altitude estimate of the bogey is good and visibility conditions are satisfactory, tallyho will usually be made while fighters are still several miles from the bogey. If this does not happen, the controller must be sure to turn the fighters on to the approximate course of the bogey soon enough to insure that they remain between the bogey and the base. The point at which this turn is made will depend upon the relative speed of fighters and bogey. When using a head-on type of interception the fighters will weave in flight to obtain a clear view ahead if told bogey is at 12 o'clock. 0800 -- "Mohawk Two-One, this is Mohawk. Vector zero-three-zero. Buster. Angels Ten. Over." "This is Mohawk Two-One. Wilco. Vector zero-three-zero. Buster. Angels Ten. Out." 0801 -- "Mohawk, this is Mohawk Two-One. Steady, south Five. Over." "This is Mohawk. Roger. Single bogey ahead, Sixty. Over." "This is Mohawk Two-One. Roger. Out." 0803 -- "Mohawk Two-One, this is Mohawk. "Bogey ahead forty-five. Over." 0805 -- "Mohawk Two-One, this is Mohawk. Bogey ahead thirty-five at Seven thousand. Over." 0807 -- "Mohawk Two-One, this is Mohawk. Bogey ahead twenty-five. Over." 0809 -- "Two-One, this is Mohawk. Bogey eleven o'clock, level. Over." "This is Two-One. Roger. Out." 0810 -- -"Two-One, this is Mohawk. Vector Starboard zero-nine-zero. Over." "Two-One, Wilco. Vector Starboard zero-nine-zero. Out." 0811 -- "This is Two-One. Steady. Out." "Two-One, this is Mohawk. Bogey ten o'clock, six. Over." 0812 -- "Two-One, this is Mohawk. Bogey ten o'clock three. Over." 0813 -- "Tallyho, this is Mohawk Two-One. Ten o'clock two, one Hawk sixty-five hundred. Over." "This is Mohawk. That is your bogey. Out." ahead if bogey is crossing, until the fighters have reached a position of not less than 12 miles from the bogey and on approximately the same bearing or on a bearing slightly ahead of the bogey in the case of a crossing bogey. In this type of interception, the position of the fighters in orbit should be such that a projection of the bogey's track will pass through or very near the orbit area. A simulated orbit consisting of short low speed vectors issued by the controller in an approximate circular pattern will result in more effective control of the fighters and may be preferable to a loosely controlled orbit. 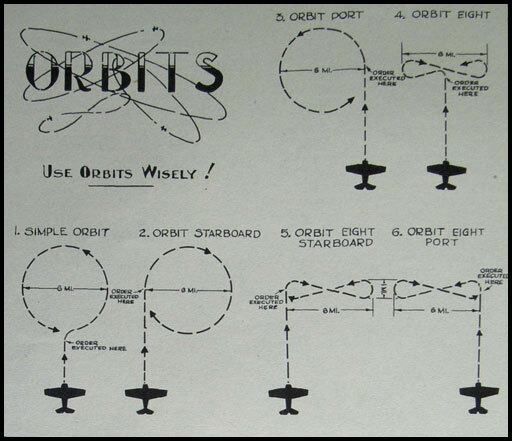 Figure 97.--Orbit type interceptions, closing bogey. 0800 -- "Mohawk Two-One, this is Mohawk. Vector zero-five-zero. Buster. Angels ten. Over." "This is Mohawk Two-One. Wilco. Vector zero-five-zero. Buster. Angels ten. Out." 0801 -- "Mohawk, this is Mohawk Two-One. Steady at Angels North Five. Over." "This is Mohawk. Roger. Out." 08011-- "Mohawk Two-One, this is Mohawk. One bogey ahead sixty. Over." 0803 -- "Mohawk Two-One, this is Mohawk. Bogey ahead forty five seven thousand. Over." "This is Mohawk Two-One. Roger. Out"
0804 -- "Mohawk Two-One, this is Mohawk. "This is Mohawk Two-One. Wilco vector starboard zero-eight-zero. Out." 0804 -- "This is Mohawk Two-One. Steady. Out." 0805 -- "Mohawk Two-One, this is Mohawk. Bogey ahead thirty. Over." 0807 -- "Two-One, this is Mohawk. 1 Bogey eleven o'clock twenty. Over." 0807 -- "Two-One, this is Mohawk. Vector port zero-five-zero. Over." "Two-One. Wilco vector port zero-five-zero. Out." 0808 -- "This is Two-One. Steady. Out." "Two-One, this is Mohawk. Bogey twelve o'clock twelve. Over." 0808 -- "Two-One, this is Mohawk. Orbit Figure eight. Over." "Two-One. Wilco orbit figure eight. Out." 0809 -- "Two-One, this is Mohawk. Bogey northeast six. Over." 0808 -- "Two-One, this is Mohawk. Bogey east five. Over." 0810 -- "Tallyho. This is Mohawk Two-One. One o'clock four. One Hawk seven thousand. Over." "This is Mohawk. That is your bogey, out." Pilots should be indoctrinated in the flight patterns of each type orbit. The figure-of-eight pattern is superior to the simple orbit in that the fighters have the bogey roughly on their beam throughout most of the orbit, assuming the figure-of-eight to be normal to the flight path of the bogey. Also, the pilots never have their backs turned to the bogey. Pilots should be indoctrinated to make tight turns at the ends of the "8." The orbit may be made to port or starboard to offset any bearing discrepancy between fighters and bogey. 1. Keeps VF between raid and base. It may be necessary to shift position of orbit from time to time to effect this. 2. Controls range of interception, keeping it within limitations of radar, radio, fuel, and tactical requirements. 3. Requires less skill and timing on part of controller. 4. Reduces danger of excessive relative speeds. 5. Increases search area of VF. 1. Reduces range of interception. 2. Reduces "positive" control of controller over VF since they are no longer "on the string" of a vector, since he is no longer able to determine the heading of the leader, and since the orbit will drift with or without the wind. 3. Reduces VF speed so as to minimize his tactical advantage. 4. Tends to spread out VF formation, thus reducing its immediate combat efficiency. 5. Requires good visibility in order that VF may have time to close their formation and build up speed. 1. Raid fades and controller has no knowledge of bogey course at a time when range from VF to bogey is nearing a critical distance. 2. Raid turns away and it is not considered desirable to pursue it. 3. Weather conditions ahead are poor. 4. CAP is at maximum desired range from base (Radar, Radio, Endurance, Tactical Requirements). 5. In some cases when continuation of vector might allow bogey to turn in behind VF. 6. Jamming and Window is in use by enemy. approximate bearing of the bogey but will also close the base sufficiently to exclude the chance of the bogey getting inside the fighters. This type of interception works best when there is good visibility. When fighters are in an orbit, the controller does not have the tight control over them that he had when he had them on a vector. He is unable, for instance, to determine with any degree of accuracy the heading of the fighters at a given time. Therefore, no attempts should be made to give fighters position of the bogey in terms of clock code while they are orbiting. Instead, fighters should be given the true direction of the bogey from them. For example, "Bogey Northeast 5 -----." Though the head-on interception may generally be the most effective way of directing fighters and should be used when possible, there are several situations where an orbit type interception can be used to advantage. may not be possible. Here the orbit type interception may be used to advantage. The orbit type interception may be used to advantage in air control or amphibious operations where land masses or large numbers of aircraft saturate the radar and make accurate tracking of fighters impossible, or where the use of geographic reference points in preference to vectors is more desirable in positioning fighters for an interception. Fighters are told to orbit a particular geographic point near which the bogey is expected to pass. The pilots are then given frequent information on position of bogey, and the interception is made in this fashion rather than by vector. This type of interception can also be used when the controller is unwilling to commit his fighters beyond recall to that particular raid. After a raid has been tally-hoed by one group of fighters, the controller may have another group of fighters orbit out in the direction of the dogfight in a position where it can stop anything that might break through, and yet is not so far "off base" that it cannot be used against any new attack which might develop. When fighters are stacked in altitude, the lower group may be unable to keep station on the higher group, resulting in two separate friendly groups on the radar. Here the controller may be unable to determine which group is which, making a controlled interception largely guess work. His best remedy is to order one group to orbit its present position. There may be a cloud bank or rain squall out in the intercept area between fighters and bogey. 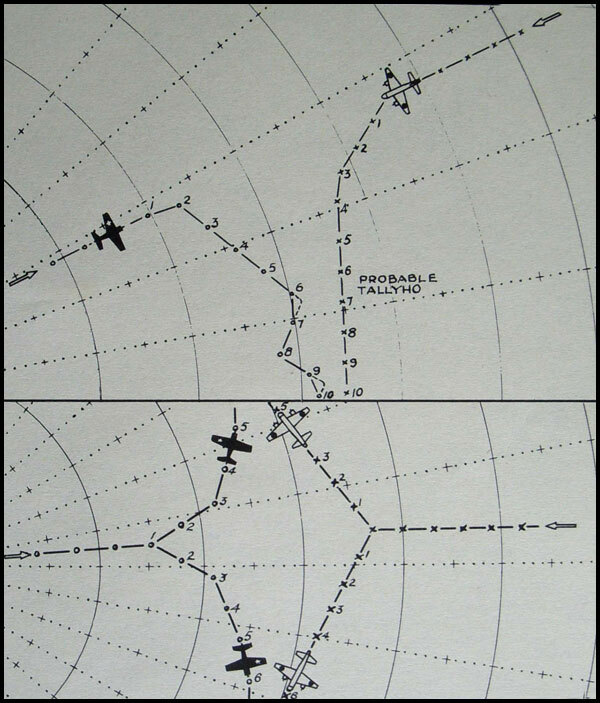 Rather than send the fighters into such an area of low visibility to intercept, it may be advisable to orbit the fighters on the near side of the cloud or rain and wait for the bogey to come through it, even though it may mean sacrificing some tally-ho range. When the track of an unidentified aircraft indicates that it will clear the task group or task force beyond air-borne radar range, it will often be advisable to orbit the combat air patrol in positions calculated to counter any future-hostile moves of the bogey. This procedure is illustrated in the following diagram. 0800 -- "(Hello) Mohawk Two-One, this is Mohawk. Vector zero-three-zero. Buster--Angels Ten. Over." "This is Mohawk Two-One, Wilco, Vector zero-three-zero--Buster--Angels Ten. Out." 0801 -- "Mohawk, this is Mohawk Two-One. Steady northeast six. Over." "This is Mohawk, Roger. Out." 0801 -- "Mohawk Two-One, this is Mohawk. One bogey ahead forty-five. Over." 0803 -- "Mohawk Two-One, this is Mohawk. Bogey ahead thirty-five at seven thousand. Over." 0805 -- "Mohawk Two-One, this is Mohawk. Bogey ahead twenty-five. Over." 0807 -- "Mohawk Two-One, this is Mohawk. Bogey eleven o'clock twenty. Over." 0807 -- "Mohawk Two-One, this is Mohawk. Orbit starboard. Over." "This is Mohawk Two-One. Wilco. Orbit starboard. Out." 0808 -- "Mohawk Two-One, this is Mohawk. "This is Mohawk Two-One. Roger. Out"
0811 -- "Mohawk Two-One, this is Mohawk. Figure 99.--Using orbit, raid passing beyond airborne radar range. "This is Mohawk Two-One. Wilco. Vector one-five-zero. Liner. Out." 0812 -- "This is Mohawk Two-One. Steady. Out." 0813 -- "Mohawk Two-One, this is Mohawk. Bogey ten o'clock twenty. Over." "This is Mohawk Two-One, Roger. Out." 0815 -- "Mohawk Two-One, This is Mohawk. Bogey ten o'clock eighteen. Over." 0817 -- "Mohawk Two-One, this is Mohawk. Bogey nine o'clock seventeen. Over." 0818 -- "Mohawk Two-One, this is Mohawk. Orbit. Over." "This is Mohawk Two-One. Wilco orbit. Out." NOTE: When bogey has opened to a safe distance, resume fighters. The controlled interception is another effective system for directing fighters. It is well to note, however, that the head-on interception must be used in coping with numerous simultaneous raids, or when the radar picture is badly confused by the presence of numerous friendly aircraft. There are several factors which will influence the decision to use the controlled type of interception. 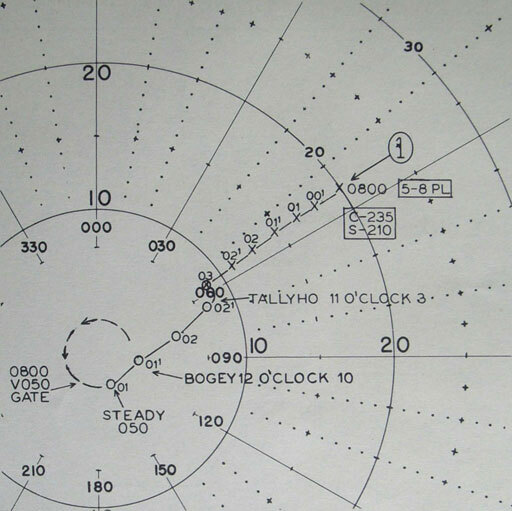 The radar picture must be clear and up to date enough so that the controller knows where bogey and fighters are at all times and can give fighters accurate position of bogey in clock code at all times. 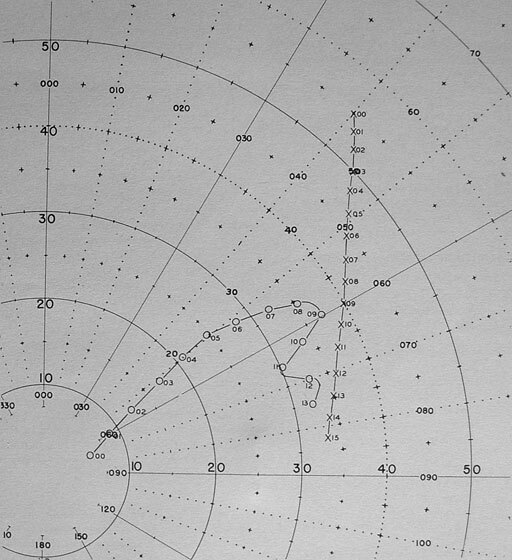 In this connection, the use of the PPI or other devices which will give an instantaneous radar picture is essential. A plot can be used if the information is good and up to date. The controlled interception consists of controlling the fighters by a series of vectors until they are in a position ahead of the bogey 1 to 3 miles, on a heading approximating that of the bogey, with the bogey in an area of good visibility. The controller should guide the fighters as the flight leader would if he could see the enemy. The controller is the fighter's eyes until the tallyho; he guides the fighter division into the best position for a run on the target. For a smooth, quick run in good visibility when the fighter is on the target's heading, the target should be about 5 o'clock or 7 o'clock, 1 or 2 miles, "down," of course. 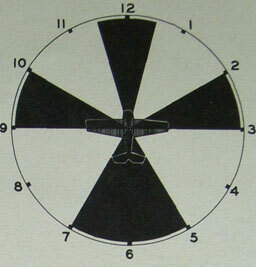 When the target is crossing, or when the friendly is turning onto the target's heading, the target is likely to be 10:00 or 11:00 from the fighter, an excellent position for visibility and a run. In order to achieve this position, the fighters must be given a vector called the safety vector, which brings them around to a course approximating the bogey's track in sufficient time to allow them to make their turn and steady on aliead of the bogey rather than astern. In the case of a closing bogey, the safety vector should cross the bogey's track by about 20°. Speed of fighters and bogey and turning rate of fighters will govern distance apart when the safety vector is given. A standard rate turn (3°/sec), which CAP fighters should always use unless otherwise directed, requires 2 minutes to turn 360°. A hard turn can be made in half that time or less, depending on the number of fighters in the group. change of something near 180°, 1 minute would be consumed in making the turn. Allowing for a time lag in execution of orders of between 15 and 20 seconds and allowing for a certain decrease in relative speed during the turn, a safety vector given when fighters and bogey are an actual distance of 9 miles apart would mean that the fighters would "steady on" approximately 2 miles ahead of the bogey. The exact distance at which to give the safety vector varies with the situation, and rests on the judgment and skill of the controller, bearing in mind relative speed and turning rate. If the controller miscalculates and lets the bogey and fighters get too close together, a hard turn may save a tail chase. 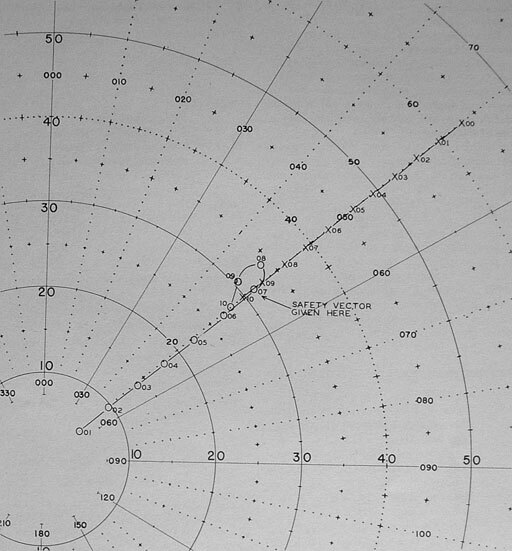 Figure 101.--Plot of controlled Interception, off-set in bearing. position of the fighters when the safety vector is given. This allows for turning circle of fighters and puts them approximately on the bearing of the bogey when they steady on. "This is Mohawk Two-one. Wilco vector zero-five-zero. Buster. Angels ten. Out." 0801 -- "Mohawk Two-one, this is Mohawk. Steady at Angels. North five. Over." 0801 -- "Mohawk Two-one, this is Mohawk. Bogey ahead fifty. Over." 0803 -- "Mohawk Two-one, this is Mohawk. Bogey ahead forty at seven thousand. Over." 0805 -- "Two-one, this is Mohawk. Bogey ahead twenty-two. Over." 0806 -- "Two-one, this is Mohawk. Bogey ten o'clock seventeen. Over." 0807 -- "Two-one, this is Mohawk. Bogey one o'clock ten. Over." 0807 -- "Two-one, this is Mohawk. Vector starboard two-zero-zero. Over." "Two-one. Wilco vector starboard two-zero-zero. Out." 0809 -- "Tallyho. This is Mohawk Two-one. Eight o'clock one. One fish seven thousand. Over." If fighters and bogey are directly head-on when the safety vector is given, they should be vectored around 20° to 40° past the bogey's track. In other words, a 200°-220° course change, assuming they are head-on and on reciprocal courses. 0800 -- "(Hello) Mohawk Two-one, this is Mohawk. Vector zero-five-zero. Buster--Angels ten. Over." "This is Mohawk Two-one. Wilco vector zero-five-zero--Buster--Angels ten. Out." 0801 -- "Mohawk, this is Two-one. Steady. Northeast five. Over." 0801 -- "Two-one, this is Mohawk. One bogey ahead fifty-five. Over." "This is Mohawk Two-one--Roger. Out." 0806 -- "Two-one, this is Mohawk. Bogey twelve o'clock fifteen. Over." 0806 -- "Two-one, this is Mohawk. Bogey twelve o'clock eleven. Over." 0807 -- "Two-one, this is Mohawk. Vector port two-zero-zero. Over." "Two-one, Wilco vector port two-zero-zero. Out." 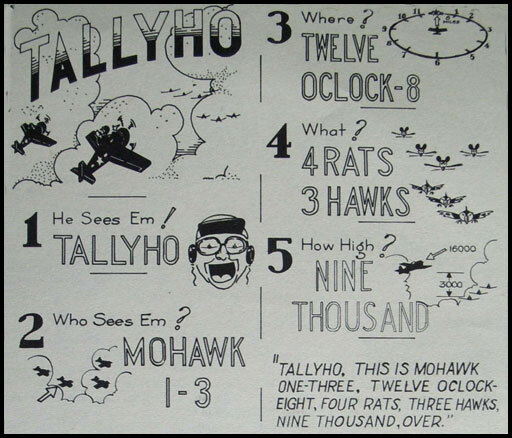 0808 -- "Tallyho, this is Mohawk Two-one, eight o'clock two. One rat seven thousand. Over." If the fighters do not sight the bogey when they cross its track, give them a vector which will take them back across the bogey's track. Continue this zig-zag procedure until the bogey is sighted. 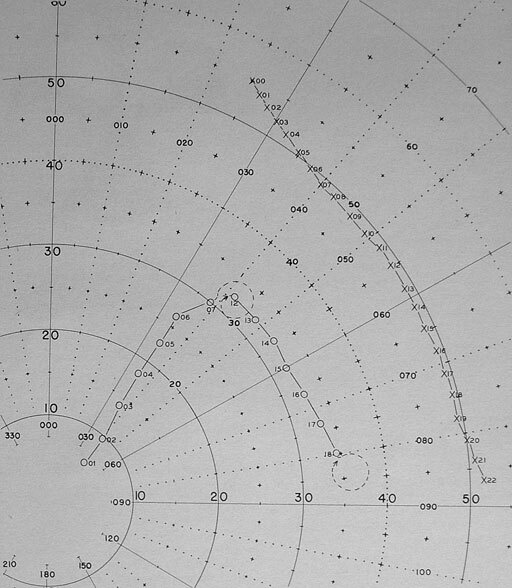 Figure 102.--Plot of controlled interception, no off-set In bearing. and unrestricted communications with the fighters. In the absence of one or both, the controller may be unable to exercise the precise control necessary to make a successful interception. In a controlled interception a late turn can be disastrous. It may permit the bogey to get between the fighters and the base. mean that the bogey would get even farther inside the fighters. Since the relative speed is considerably slower in the case of a crossing target, the fighters can be allowed to approach closer to the bogey before the safety vector is given. The safety vector, in this case, should not cross the bogey's track, but should come to within definite visibility range of the bogey and then parallel inside of the bogey. Always turn in the direction the bogey is traveling. For example, if a bogey bears 090° from base on a course 180°, a good safety vector would be 230°, assuming that the fighters were on same bearing as bogey at the time the safety vector is given. Such a vector would keep the fighters in a good position even if the bogey suddenly turned ine The turning circle of the fighters would carry them to the immediate vicinity of the bogey, and a tally-ho should result in the turn or immediately after they steady on. If not, and the range between fighter and bogey commences to open, turn them back toward the bogey and repeat the above procedure at the proper time. 0800 -- "Mohawk Two-One, this is Mohawk. Vector zero-four-zero--Buster--Angels ten. Over." "This is Mohawk Two-One. Wilco vector zero-four-zero--Buster--Angels ten. Out." 0801 -- "Mohawk, this is Two-One. Steady northeast nine. Over." 0802 -- "Mohawk Two-One, this is Mohawk. One bogey ahead forty. Over." 0804 -- "Mohawk Two-One, this is Mohawk. Bogey ahead twenty-five, at seven thousand. Over." 0805 -- "Mohawk Two-One, this is Mohawk. Vector starboard zero-eight-zero. Over." 0805 -- "This is Mohawk Two-One. Steady. Out." 0806 -- "Mohawk Two-One, this is Mohawk. Bogey eleven o'clock fifteen. Over." 0807 -- "Two-One, this is Mohawk. Bogey eleven o'clock ten. Over." 0808 -- "Two-One, this is Mohawk. Vector starboard two-two-zero. Over." "Two-One. Wilco vector starboard two-two-zero. Out." 0809 -- "This is Two-One. Steady. Out." 0810 -- "Two-One, this is Mohawk. Bogey seven o'clock five. Over." 0811 -- "Two-One, this is Mohawk. Vector hard port one-zero-zero. Over." "Two-One. Wilco vector hard port one-zero-zero. Out." 0811 -- "This is Two-One. Steady. Out"
0812 -- "Two-One, this is Mohawk. Vector starboard two-two-zero. Over." 0812 -- "Two-One. Steady. Out." "Tallyho--This is Mohawk Two-Two-- seven o'clock. One fish seven thousand. Over." When steady on safety vector, fighters should have bogey in a position for prompt sighting. If not, change the vector to accomplish this. Postion of the bogey should be given in clock code to the pilots when steady. It is impractical to give clock code position of bogey to fighters while they are in a turn. another sweep." If this procedure results in turning too soon and steadying on too far ahead of the bogey, there are ways to remedy the situation. The fighters can be slowed down; or if this is impractical, they can be given a vector normal to the bogey's track, and after the bogey has "caught up" turned to a course that will cross the bogey's track by 20° to 40°. A successful controlled interception requires a large degree of skill, and should not be attempted by an inexperienced controller. Figure 103.--Plot of controlled interception, crossing raid.